14:09 GMT - WE ARE NOW CLOSING THIS LIVE REPORT as the search for AirAsia flight QZ8501 ends for a second day with Indonesian officials warning that the passenger plane is probably at the bottom of the Java Sea. Dozens of planes and ships have joined the multinational search in Indonesian waters as anguished relatives await news of their loved ones more than a day after the jet disappeared with 162 people on board. The search will resume at first light on Tuesday and will focus on an oil patch spotted off Belitung island, across from Kalimantan on Borneo island. 13:47 GMT - Harrowing phonecall - The co-pilot's mother, Rolande Peronet-Plesel, has meanwhile described the harrowing moment when she was told her son was missing. Peronet-Plesel tells French news channel BFMTV that she received the call every parent dreads at 3:00am, from her son's girlfriend. "She told us that the plane Remi was flying had gone down," she says. "I'm waiting but we're used (to planes going down) and not finding people. They have never found the last plane that went down in the same place," she tells the news channel -- in an apparent reference to missing Malaysia Airlines MH370. 13:43 GMT - Christmas message from co-pilot - More from the co-pilot's sister, who tells French radio station RTL that she last spoke to him on Friday over the Internet. "We want them to find the plane, to explain to us what happened and to know whether we can go there, myself and my mother," Renee Plesel tells RTL. 13:34 GMT - Survival chances - Renee Plesel is realistic about her chances of seeing her brother -- originally from the island of Martinique in the Antilles -- alive. "When a plane falls out of the sky, there are hardly any survivors," she tells French radio station RTL. 13:30 GMT - Tribute to "excellent" pilot - The sister of Remi Plesel, the French co-pilot of the AirAsia jet that has disappeared with 162 people on board, pays tribute to an "excellent" pilot. Aviation was his "passion", his sister Renee tells French radio station RTL. "Since he was very young, it was his dream to be a pilot and the dream came true. He had been in Indonesia for three years ... He was a very good pilot, an excellent one," she says. 12:33 GMT - Next of kin - Singapore says it is continuing "to provide support and assistance to the next of kin of passengers" on Flight QZ8501. "This includes regular briefings by representatives of AirAsia, Changi Airport Group and Singapore's Ministry of Transport," it says in a statement. AirAsia has already flown 16 next-of-kin to Indonesia and plans to transport another 11 flew there today. 12:29 GMT - Singapore flotilla - Singapore says two C-130 aircraft will join the multinational search for AirAsia Flight QZ8501. The city-state has already sent three warships to join the search efforts and a submarine support and rescue vessel is also ready to sail following Indonesia's approval of its deployment. 12:19 GMT - Sonar pings - Indonesia's National Search and Rescue Agency chief Bambang Soelistyo says the multinational search teams are scouring an area where the Java Sea is 40-50 metres (130-160 feet) deep. Indonesia has accepted Singapore's offer of two sets of underwater locator beacon detectors to scour the seabed. However, aviation expert Gerry Soejatman tells AFP that despite the shallow water in the search area, "mud and hard rocks" could interfere with sonar pings emitted by the plane's Emergency Locator Transmitter (ELT). 12:10 GMT - No distress signal - The lack of any distress signal is still baffling experts and could lead to a complete overhaul of aviation location devices. All planes have an Emergency Locator Transmitter (ELT) and a "black box" consisting of the cockpit voice recorder and the flight data recorder. If these devices are immersed in water they should activate a "pinger" that can draw investigators to the location. However, the sound cannot be heard over long distances. Gerry Soejatman -- a consultant with the Jakarta-based Whitesky Aviation chartered flight provider -- says AirAsia "does not subscribe" to ACARS (Aircraft Communications Addressing and Reporting System) -- which sends short messages to ground controllers -- even though the Airbus A320-200 is equipped with the system. He says authorities must move quickly to improve technology that help locate aircraft when they go missing. "Even with MH370 the beacon did not go off. Why aren't we getting the beacon in large-scale incidents?" he says. 12:06 GMT - "Falling out of the sky" - Some experts say initial radar readings indicate that Flight QZ8501 was flying much slower than it should have been when it disappeared. In the Air France Flight AF447 crash in 2009, it is believed a build-up of ice on "pitot tube" instruments caused the pilots to receive distorted data on airspeed before the aircraft went down. He added that low ground speed could have been caused by strong headwinds. Soejatman said early readings from a leaked air traffic control image circulating online showed Flight QZ8501 was "extremely slow". "If the plane happened to be going below stall speed, then well, you will fall out of the sky," Gerry Soejatman, a consultant with the Jakarta-based Whitesky Aviation chartered flight provider, tells AFP. 11:41 GMT - Impact of severe weather - A day after it disappeared en route from east Java in Indonesia to Singapore, mystery still surrounds the fate of AirAsia flight QZ8501. Investigators will examine what impact the severe weather played on the plane's fate. Air traffic controllers lost contact with the twin-engine aircraft around an hour after it left Juanda International airport at Surabaya in East Java at 5:35 am Sunday (2235 GMT Saturday). Shortly before it vanished from the radar screens, AirAsia said the pilots had asked air traffic controllers for permission to deviate from its flight plan and climb above bad weather in an area noted for severe thunderstorms. Gerry Soejatman, a consultant with the Jakarta-based Whitesky Aviation chartered flight provider, says the verdict is still out on whether bad weather conditions was the "primary factor or just a contributory factor" for the disappearance of the passenger plane. "Based on the public information we have, the pilots turned to the left of its designated route, and also requested to climb to a higher altitude," Soejatman tells AFP. "Approval was given for the left turn but there are indications the plane climbed without approval. If that is the case, the turbulence could have been severe and the pilots made a decision to save the aircraft rather than wait for approval," he adds. 11:34 GMT - Relatives' "sadness" - Over in Surabaya, anxious relatives await news about their loved ones alive as international teams scour the Java Sea for any sign of the lost plane. Vicky says he had not given up hope of finding his two siblings who were on the flight, and criticised an airline official who said he shared the families' "sadness" at the plane's disappearance. "What he said was not appropriate at all. If they were sad it means there's death. But the flight has not been found yet," he tells AFP. 11:26 GMT - Support and assistance - Malaysia Prime Minister Najib Razak has personally thanked Indonesia for leading the multinational search for Flight QZ8501. "Called President Joko Widodo. Expressed our deep concern. Offered M'sia's fullest support & assistance to Indonesian search & rescue effort," he tweeted from @NajibRazak. 11:20 GMT - "Strength and unity" - The disappearance of Flight QZ8501 comes at the end of a disastrous year for Malaysian aviation. Malaysia Airlines Flight MH370 disappeared while flying from Kuala Lumpur to Beijing in March with 239 passengers and crew, and the same airline was dealt another body blow when in July when Flight MH17 was shot down over Ukraine killing all 298 on board. 10:55 GMT - Distraught relatives - Distraught relatives are still waiting for news at Singapore's Changi Airport before boarding a flight to Surabaya international airport in Indonesia. One of the 162 people on board the plane has been identified as Florentina Maria Widodo, a 26-year-old biology teacher from Indonesia, according to the Straits Times. Her Singaporean boyfriend spoke to reporters before travelling to Surabaya. "She is my girlfriend. I'm going there now to meet her family members," Andy Paul Chen told a large crowd of reporters. 10:34 GMT - Support for airline - German insurance giant Allianz confirms it is the lead insurer for the AirAsia jet which disappeared en route from Indonesia to Singapore with 162 people on board. "We can confirm that Allianz Global Corporate and Specialty UK is the lead reinsurer for AirAsia, for aviation hull and liability insurance," Allianz says in a statement. "It is much too early to comment on reports of this incident at this stage, except to say that our thoughts and prayers are with all those affected by this missing flight," it adds. 10:24 GMT - Weather hampering search - More details are starting to emerge about the multinational search for any sign of the Airbus A320-200 jet that disappeared over the Java Sea. Indonesian Vice President Jusuf Kalla says 15 ships and 30 aircraft are scouring the area for any debris that would suggest the jet plunged into the sea. "It is not an easy operation in the sea, especially in bad weather like this," he said. Indonesian Air Force spokesman Hadi Tjahjanto tells AFP that the search is now focused on a patch of oil spotted off Belitung island in the Java Sea. Australia, Singapore and Malaysia have deployed planes and ships to assist in the Indonesian search for Flight QZ8501, which disappeared on Sunday en route to Singapore. 10:01 GMT - Objects not from AirAsia - An object spotted during a sea search for an AirAsia plane was not from the aircraft, Indonesian Vice President Jusuf Kalla says after reports that an Australian surveillance aircraft had found something. "It has been checked and no sufficient evidence was found to confirm what was reported," Kalla told a press conference at Surabaya airport from where the ill-fated plane departed. 09:44 GMT - AirAsia shares plummet - Shares in AirAsia slumped almost nine percent in Kuala Lumpur, after one of its jets disappeared with 162 people on board. Analysts said the impact on the low-cost sector would be limited owing to its popularity. The firm slumped 12 percent to 2.60 ringgit at the opening bell but recovered slightly to sit at 2.69 ringgit, still down 8.50 percent, at the close. 08:40 GMT - Underwater Locator Beacon - Steven Teo, a senior investigator at the Air Accident Investigation Bureau of Singapore, has explained to the media how specialist equipment can be used on board boats to help with the search. One of the four specialists heading to Indonesia, Teo says the equipment is lowered into the water over the side of a boat and then rotated 360 degrees. An operator wearing headsets listens out for a pinger signal. "As the hydrophone rotates and faces directly towards the source, which is the ULB (underwater locator beacon), the audio signal will get louder and louder." The operator of the equipment will have to judge where the signal is coming from. Ideally, the operator will locate the most accurate azimuth from at least three different points to be able to triangulate the estimated location of the ULB, Teo says. "After having this information we will send either divers or underwater autonomous vehicles depending on the water depth and condition." 08:17 GMT - Adam Air - Previous aviation accidents in Indonesia's Java Sea include the crash of Adam Air Flight 574 on January 1, 2007. A plane of the now-defunct airline lost contact with air traffic control while it was flying over the Java Sea. The Boeing 737-400 carrying 102 people mostly from Indonesia, was on its way from Surabaya to Manado. Parts of the plane were found only 10 days later off the west coast of Sulawesi. Investigators found that the pilots had accidentally disconnected the autopilot system while trying to fix a problem in the navigation instruments. 08:13 GMT - Father of Pilot - The BBC's has spoken to the father of the missing pilot in Surabaya. Tragically, he had just buried his other son last week who died from diabetes. He told the BBC that was the last time he had seen his son. 07:48 GMT - AirAsia CEO Praised - Tony Fernandes, the head of AirAsia, is being praised by analysts for the way he has handled the situation, especially a raft of tweets the former record industry executive has sent out praising his airline's crew, placing faith in search and rescue operations, and thanking neighbouring governments for their help. In particular they have compared the way Fernandes reacted to the way Malaysia Airlines handled the disappearance of its flight MH370 earlier this year. "This shows air travellers that AirAsia cares and this is in stark contrast to Malaysia Airlines' handling which was slow and disorganised," Daniel Tsang, a Hong Kong-based aviation analyst at Aspire Aviation, tells AFP. Shukor Yusof, founder of aviation research firm Endau Analytics, says Fernandes's "composed and responsible" leadership was "inspirational to his staff and victims' families". 07:28 GMT - Hong Kong Resident - Hong Kong's immigration department has confirmed that a passenger who holds a foreign passport also holds Hong Kong residency status, Apply Daily reports. The department has contacted his next of kin. British and Hong Kong media have reported the man's name as Choi Chi-man, who is believed to be a British citizen who lives and works in Singapore. 07:23 GMT - Flight Code - AirAsia plans to retire the flight code QZ8501, Malaysia’s Star Online reports. “We have forwarded our suggestion to the headquarters, but we are still waiting for the approval and coordination from the headquarters,” The Star quotes AirAsia CEO Sunu Widyatmoko as saying. "Aviation regulators are infamous for their "tombstone" mentality -- not requiring safety changes until people die. "How many people have to die before regulators finally mandate real-time flight tracking? "ICAO, the international organization that overseas safety and regulatory issues, has been dithering since MH370 about mandating real-time flight tracking. But the issue has been around since the 2009 Air France crash. There has been no action. "AirAsia demonstrates that real-time tracking is not just trans-ocean flights that need tracking. MH370 also showed this -- the flight was a relatively short, intra-Asia flight with an even shorter over-water portion when contact was lost. "It's time for ICAO to make a decision, and if it doesn't then individual country regulators need to step up and require real-time tracking. This won't save the lives lost but recovering wreckage and the black boxes in a timely manner could lead to safety and operational changes that will save lives in the future. We don't need more tombstones." 07:07 GMT - Search Expanded - The search is focused on waters around the Indonesian islands of Bangka and Belitung in the Java Sea, across from Kalimantan on Borneo island. National Search and Rescue Agency chief Bambang Soelistyo says the search area had been expanded northwards in the waters between Sumatra and Kalimantan. "We are looking around Bangka, Belitung islands, Singkep, Karimata Strait, as well as the land area west of West Kalimantan." Currently search teams are scouring an area where the sea is 40-50 metres (130-160 feet) deep. 06:59 GMT - Beacon Detectors - The Civil Aviation Authority of Singapore has released a statement: "Indonesia has accepted Singapore's offer of two teams of specialists and two sets of underwater locator beacon detectors to assist in locating the flight data recorders of the missing Indonesia AirAsia aircraft, QZ8501. "The four specialists from the Singapore Ministry of Transport's Air Accident Investigation Bureau and their equipment are ready to be deployed, pending the Indonesian authorities' activation." 06:56 GMT - 'Makes You Wonder" - Andreas, a relative of an Indonesian passenger on the missing plane, has told AFP’s videojournalist Gianrigo Marletta in Surabaya: "As family, of course I am sad. This is the first incident for AirAsia, nothing we would have ever expected. And it’s an Airbus, that's also makes you wonder". 06:46 GMT - Miraculous Escape - An Indonesian family of 10 has told AFP that they had a miraculous escape when they arrived too late to catch AirAsia Flight QZ8501. Christianawati, 36, said the 10 of them, who included her family, her mother and her younger brother's family, were heading to Singapore to celebrate New Year. "They emailed and called us on December 15 and 16 to inform us but we missed those calls," Christianawati said. "So we arrived at the airport to check in for the 7:30am flight but were told our flights had been rescheduled to 5:30am and we were late. Of course we were angry," she said. "While the new tickets were being reissued, we heard that the earlier plane had crashed so we cancelled our flights immediately," she said. "I was shocked to hear about it and cried. Maybe it is all God's plan that my family and I were not on the flight. It was a blessing in disguise," she said. "I hope that the plane is found and everyone is safe." Christianawati said she would be switching airlines. "We travel to Singapore twice a year and always by AirAsia. We consider it a safe airline ... but now our confidence in AirAsia is somewhat shaken and we shall just stick to Garuda Indonesia," she said. 06:32 GMT - Updated map and factfile on AirAsia flight QZ8501 that went missing with 162 people on board. Includes timeline of events. 06:17 GMT - China Offer - China has offered to send aircraft and ships to help in the international search. "China has already said to Indonesia that it is willing to urgently send planes and ships to participate in search and rescue," foreign ministry spokeswoman Hua Chunying says in a statement posted on the ministry's website. Beijing "will provide other aid according to Indonesia's needs," the statement adds. "The warmth and support from the people of Indonesia has been incredible. Everywhere I go. Nothing but pure support." "The staff in Indonesia have been brave, strong, committed and doing 150 percent for all our guests. My pride for them is enormous." 06:01 GMT - A man looks at a map showing the search area for missing AirAsia flight QZ8501 outside the crisis-centre set up at Juanda International Airport in Surabaya. 05:47 GMT - No Comparison with MH370 - Australian Prime Minister Tony Abbott, talking to Sydney radio station 2GB, has said the disappearance of AirAsia Flight QZ8501 cannot be compared to the loss of Malaysia Airlines Flight MH370. Australia is leading the search for MH370 which was on a routine flight from Kuala Lumpur to Beijing when it disappeared off radars on March 8 with 239 people on board. "I think it would be a big mistake to equate what has happened here with MH370. 05:43 GMT - Social Media Response - Social media users have offered prayers and messages of support to family members of the victims via Facebook and Twitter, and urged the carrier's flamboyant chief executive Tony Fernandes to remain strong. QZ8501's disappearance has come as Malaysia grapples with its worst floods in decades, which have displaced more than 160,000 people, piling further anguish on the country. Uthaya Kumar Pillai, meanwhile, referenced Malaysia's diversity when he wrote on the social networking website: "My support for SAR (search and rescue) team. Let us unite together and pray for 8501 regardless of race." 05:37 GMT - Singapore's Air Accident Investigation Bureau displays devices ready to be deployed in the search for QZ8501, at Changi Airport. Indonesia has accepted Singapore’s offer of specialists and two sets of underwater locator beacon detectors. 05:31 GMT - Malaysian Prayers - With the painful memory of two plane disasters this year still fresh, the news has left many in Malaysia bewildered during the traditional year-end festive season. Churches nationwide have lit candles, praying for the plane to be recovered and for the safe return of all its passengers and crew. "Our hearts go out to all the families who in anguish are awaiting news of the whereabouts of the plane," The Council of Churches Malaysia wrote on its Facebook page. "In the meantime churches throughout the country will join all other Malaysians in lighting of candles and praying for the families." Harussani Zakaria, the mufti of northern Perak state, attributed the air tragedy and floods to domestic political bickering. 05:12 GMT - AirAsia boss Tony Fernandes (L) speaks with the Indonesian Minister of Transport Ignatius Jonas at the airport in Jakarta as search operations for missing AirAsia flight continue. 05:09 GMT - Prejudice Feared - Malaysian Transport Minister Liow Tiong Lai urges travellers not to be prejudiced against Malaysian airliners, Channel News Asia reports. He is also quoted as saying that Malaysia is ready to deploy more assets for the QZ8501 search if Indonesia requests it. 05:01 GMT - Fernandes on Twitter - Fernandes adds on Twitter: "Keeping positive and staying strong. My heart bleeds for all the relatives of my crew and our passangers. Nothing is more important to us." 05:00 GMT - An Indonesian woman wipes her eyes while holding a family picture of passengers on the missing AirAsia plane, outside the crisis-centre set up at Juanda International Airport in Surabaya. "In Jakarta this morning to communicate with Search and Rescue. All assets now in region. Going back to Surabaya now to be with families." 04:51 GMT - Air Travel - "This incident will not dampen air travel on AirAsia because it is a budget carrier which appeals to the mass market amid growing affluence in the region," economist Yeah Kim Leng, dean of Malaysia University of Science and Technology School of Business, has told AFP, as AirAsia shares slumped 12 percent to 2.60 ringgit on Monday. 04:50 GMT - Photojournalists try to take pictures of family members of passengers on missing AirAsia flight QZ8501 as they sit inside a crisis-centre set up at Juanda International Airport in Surabaya. 04:14 GMT - Flight QZ8501 'Landed'... - The AirAsia Flight number QZ8501 is still being used by planes travelling from Surabaya in Indonesia to Singapore's Changi Airport. On Monday morning Changi airport's arrival's board showed Flight QZ8501 had LANDED. This is despite yesterday's plane remaining missing with 162 people on board and crowds of grieving relatives gathering at the airport awaiting news on their loved ones. Malaysia Airlines continued to use the flight number MH370 for almost a week after the plane went missing while flying from Kuala Lumpur to Beijing in March with 239 passengers and crew. Beijing airport arrival boards showed Flight MH370 had LANDED. The flight number was eventually removed and is no longer used. 04:13 GMT - An AirAsia flight attendant (C) gives a safety demonstration on a flight preparing to depart from Kuala Lumpur to Surabaya at Kuala Lumpur International Airport 2 in Sepang. 04:11 GMT - Indonesian Transport Minister - Indonesia's transport minister says the government will review AirAsia's operations in the Southeast Asian country following the plane's disappearance. "We will do a ground check as well as a review of AirAsia's operations in Indonesia to ensure that all of its activities are better in the future," Ignasius Jonan has told reporters. 04:10 GMT - Relatives Holding Area - Changi airport is providing the relatives of passengers with refreshments and emotional support through trained counsellors, CAG spokesperson Ivan Tan told AFP’s Stefanus Ian. Speaking to the media outside the relatives holding area, he said that none of the relatives stayed overnight at the airport and the number of relatives inside the holding area varies as they move in and out of the area to "stretch their legs". He said that at any given time there could be "20-10" people in the holding area. The relatives of the passengers began arriving today at about 8am in the morning. Officials cannot confirm if there will be another flight taking any relatives in Singapore to Surabaya today. But Ivan Tan said that relatives have the option of doing that. AirAsia is liaising with various airlines to secure seats for the relatives. Tan warned against "generalizing too much" about the relatives' situation. "It is difficult for bystanders to guess what their emotional states are right now." 03:58 GMT - AirAsia staff talk to family members of passengers on missing flight QZ8501 at the airport in Surabaya, East Java. 03:45 GMT - Changi Airport - AFP’s Stefanus Ian, who is covering the story at Changi Airport, says "the atmosphere is pretty muted". Many onlookers are not aware of the situation and have been asking if the TV crews and media are awaiting the arrival of a celebrity. As the day goes on more and more media are arriving. At any given time there are at least four policemen guarding the entrance. Airport staff can be seen entering and leaving the relatives holding area. 03:41 GMT - Social Media - and continue to dominate Twitter in Indonesia, one of the world's largest social media markets. 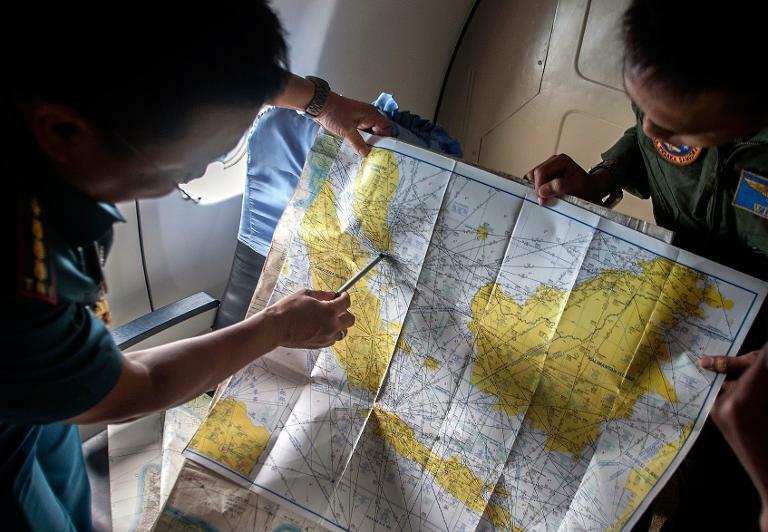 03:33 GMT - Indonesian Air Force officials show maps to journalists of the search area for the missing Malaysian air carrier AirAsia flight QZ8501, at the airport in Surabaya, East Java. 03:25 GMT - Lacking Tools - If the plane has crashed and sunk, Indonesia does not have "the tools", such as submersible vehicles, required to retrieve the plane from the seabed, says the chief of the National Search and Rescue Agency Bambang Soelistyo. But he insists it is reaching out to other countries for help if necessary. "Due to the lack of technology that we have, I have coordinated with our foreign minister so we will borrow from other countries which have offered. They are the UK, France and US." 03:23 GMT - Crowd-sourcing Offer - The satellite service Tomnod, used in an attempt to help find missing Malaysia Airlines flight MH 370, says it stands ready to search for the missing AirAsia plane if necessary and has "tasked" its satellites to scan the area the plane was last seen. If the search and rescue teams are unable to recover and rescue the missing plane, Tomnod says it will release satellite imagery and launch a crowdsourcing campaign. "We can't anticipate exactly when we will be able to collect images - it depends on daylight, weather and cloud cover," Tomnod is quoted as saying in the Sydney Morning Herald. "We will send an email out and notify people on Facebook and Twitter as soon as we launch a campaign." 03:18 GMT - Passengers queue at an AirAsia check-in counter inside terminal 1 at Changi international airport in Singapore. 03:14 GMT - Pilot's Daughter - The daughter of the pilot on the missing AirAsia plane has posted a touching message on social media, pleading with her father to come home, the Straits Times reports. Angela Anggi Ranastianis, 22, wrote in the message on Path: "Papa, come back, I still need you. Return my papa to me. Papa, come back, pa. Papa needs to be found, papa must return." The pilot has another daughter, Arya Galih Gegana, who is seven years old, reported Liputan6.com and The Guardian. The girls were living with relatives in Yogyakarta, and had planned to return on Sunday evening to the pilot’s hometown of Sidorajo, East Java, to be with their mother, Ida, who has locked herself in her room after hearing that the plane had gone missing, The Guardian reports. 02:46 GMT - Natural Market Reaction - Responding to the fall in AirAsia shares, Shukor Yusof, founder of aviation research firm Endau Analystics told AFP investors and creditors will remain firmly behind AirAsia and its CEO Tony Fernandes, who transformed a floundering carrier into Asia's most successful budget airline. 02:44 GMT - A relative shows a picture of passengers who are travelling on the missing AirAsia plane on her mobile phone screen at the airport in Surabaya, East Java. 02:43 GMT - Singapore Aid - Singapore has deployed two more vessels to help in the search and rescue effort. A Republic of Singapore Air Force C130 plane joined the search operations on Sunday and two more planes from Singapore are expected to join the mission on Monday. Submarine support and a rescue vessel are also on standby for deployment. 02:34 GMT - 'Estimated Crash Position' - Indonesia's National Search and Rescue Agency chief Bambang Soelistyo has told the gathered media: "Based on the coordinates given to us and evaluation that the estimated crash position is in the sea, the hypothesis is the plane is at the bottom of the sea. 02:30 GMT - People watch as an AirAsia plane taxis on the tarmac after landing at Changi international airport in Singapore. 02:26 GMT - 'Bottom of the Sea' - AirAsia plane likely 'at bottom of sea': Indonesia search chief tells AFP. 02:25 GMT - AirAsia Shares Fall - Shares in AirAsia, Southeast Asia's biggest budget airline, have lost more than seven percent in morning trading in Kuala Lumpur. 02:17 GMT - AirAsia's Tony Fernandes describes 'terrible sense of loss' - VIDEO: AirAsia's Tony Fernandes describes 'terrible sense of loss' and says first priority is the look after the families. 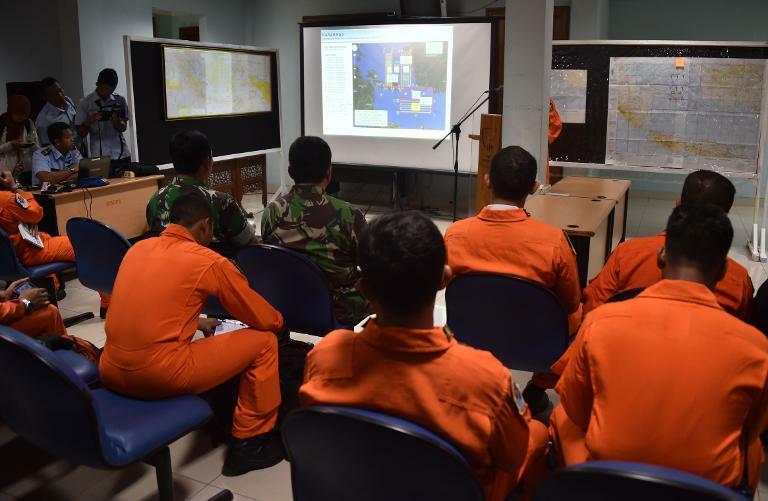 02:09 GMT - Australian Help - Australia has joined the Indonesia-led search for the plane. A Royal Australian Air Force AP-3C Orion has left the northern city of Darwin to join the operation, which is centred on the Java Sea, the Australian Defence Force says. "The RAAF AP-3C Orion aircraft has a well proven capability in search and rescue and carries maritime search radar coupled with infra-red and electro-optical sensors to support the visual observation capabilities provided by its highly trained crew," Chief of defence Air Chief Marshal Mark Binskin has told the media. 02:00 GMT - Experienced Crew - AirAsia says the captain and first officer are both experienced. The captain in command has a total of 20,537 flying hours of which, 6,100 flying hours are with AirAsia Indonesia on the Airbus A320. The first officer has a total of 2,275 flying hours with AirAsia Indonesia, the airline says. The aircraft underwent its last scheduled maintenance on November 16. Airbus says the plane is a six-year-old A320-200 that had carried out some 13,600 flights or a total of about 23,000 flight hours. 01:50 GMT - Republic of Singapore Navy servicemen board the Formidable-class frigate RSS Supreme before departing for Indonesia to take part in the search for missing AirAsia Flight QZ8501. 01:40 GMT - Panicked Relatives - Panicked relatives remain waiting at Singapore's Changi airport while in Surabaya hundreds of Indonesians have thronged the terminal. An anguished 45-year-old woman has told AFP she has six family members on the plane. "They were going to Singapore for a holiday. "They have always flown with AirAsia and there was no problem. I am very worried that the plane might have crashed." 01:36 GMT - Stormy Weather - Shortly before the plane disappeared, the pilot asked to ascend by 6,000 feet to 38,000 feet to avoid stormy weather, according to Djoko Murjatmodjo, an Indonesian transport ministry official. "The plane requested to air traffic control to fly to the left side, which was approved,” he said. 01:33 GMT - On Board - AirAsia says 155 of those on board Flight QZ8501 are Indonesians, with three South Koreans and one person each from Singapore, Malaysia, Britain and France. The Frenchman is the co-pilot. 01:22 GMT - South Korean Prayers - South Korean Christians in the southern port city of Yeosu have attended church services for the three Korean passengers on the missing AirAsia plane. Yonhap reports that the church's pastor has confirmed one of the missing Koreans is 37-year-old Park Sung-Bum and that he was sent to Indonesia as a Christian missionary. 01:14 GMT - Aircraft Sent - Five aircraft are being sent to search for the plane, including two C130 military aircraft and a Boeing 737, Indonesian air force spokesman Hadi Cahyanto tells AFP. "Two planes have already left. Three more will follow suit. It is cloudy in some parts but still bright," Cahyanto said. "We are focusing the search area in the waters on the eastern and northern part of Belitung island." 01:07 GMT - Search Resumes - Indonesia resumed the sea and aerial search at dawn for the plane that went missing in the Java Sea. "We have resumed the search for the missing AirAsia plane at 6:00 am (2300 GMT Sunday). 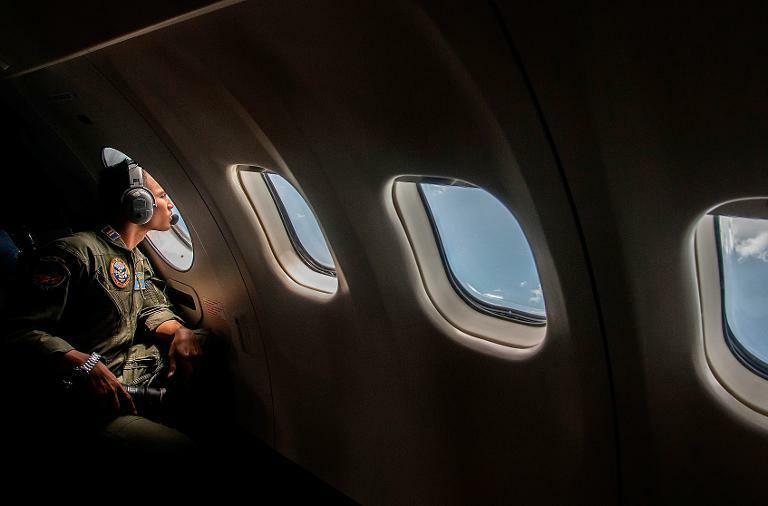 We are heading to east Belitung island," Tatang Zainuddin, deputy operations chief of Indonesia's National Search and Rescue Agency (Basarnas) has told AFP. "We are expecting vessels and planes from Malaysia and Singapore (to assist in the search). We hope we can find the plane as soon as possible." 00:53 GMT - WELCOME TO AFP’S LIVE REPORT on the search for missing AirAsia Flight QZ8501 carrying 162 people. The Airbus A320-200 disappeared on Sunday en route from Surabaya in Indonesia's east Java to Singapore, in the third crisis for a Malaysian carrier this year. The search for the plane was halted after 11 hours when night fell on Sunday and has been resumed at sunrise Monday.